I think one of the things that really got me excited and hooked on Gunpla was assembling my first Zaku II 2.0 kit, the MG Zaku 2.0 Shin Matsunaga. It was my second kit and just seeing how the frame with its moving parts went together blew my mind. I’ve assembled so many Zaku and MG kits since then but the memory of seeing the frame for the legs of a 2.0 Zaku II is one of my fondest. 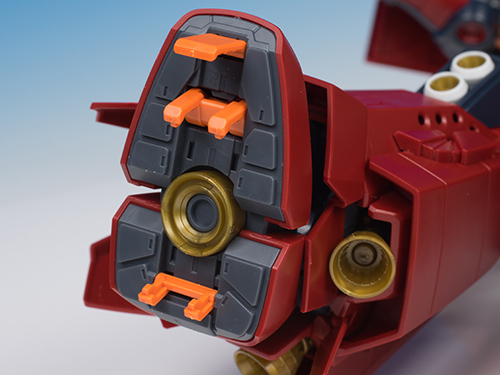 I guess that’s a long way of saying that this new Psycho Zaku which uses many of those parts is right up my alley! And the start of the lower body assembly begins with 2.0 feet! There is one part different there. Can you spot which one? It’s the bottom piece which takes this next gold piece. You then prepare the back of the foot. That little orange piece doesn’t appear to move. You’ll add some mechanical pieces from the 2.0 here on the foot but these blue pieces for the back are new. Now prepare the bottom of the front of the foot. These orange parts do move. Attach that to the frame and from the armour piece on from above. Now for a very familiar ankle joint. Just add the armour for the top and your foot, or feet, is/are complete. Now we get into the legs and the first part is new. The bottom piece is new but those familiar side pieces are indeed from the 2.0. The 2.0 had a moving part in there but that isn’t part of the Psycho Zaku build and so that space is left open. There is even a gap where the moving piece would fit. But you won’t see it because Frame Covers! On the FA Gundam you pre-wrinkled them but you’re not instructed to do that with this kit. Instead you’re meant to slide it on until it catches not the tabs on the frame and then compress it down to wrinkle it. Which made it quite difficult to slide over the large frame part. Prepare the frame parts for the lower leg. You’ll need to make sure the Frame Cover is tucked into those tabs. You should be able to drop the frame into the larger part. That is a big leg. Bend the knee to expose the tabs on the upper frame piece and tuck the frame cover in there. Then add the frame parts for the sides of the upper leg. I used a toothpick to push frame cover edges out of the way. To either side of the thigh frame you’ll add a red piece. Then the larger red front and back parts go on. 2.0 hip joints! Snap that in and add the armour for the sides and front of the knee. Two thrusters go into the knee while another mounts to the inside of the leg. That thruster will jut out at an angle. Here’s what goes on the outside of the lower leg. Another thruster. Oh what a surprise. Now for the armour for the lower leg. There is a part for the inside and for the outside. Both take the same additional parts. Place those on your lower leg. Add the red parts for the front and back. You have to snake the back piece on around the thruster piece. Then you can add the thruster itself. You do the same with this new Zaku that you did with the 2.0. Put on eight very tiny parts. Plug it into the side of the leg and then bend it over to fit it into the armour piece. That gives you this leg. And that’s where I had to stop. Is it has same range movement as zaku 2.0 space type legs? because if so,then it could only bend about 90 degree. Yes apparently the legs are pretty much the same as the zaku 2.0 high mobility type so the articulation in the legs will be pretty bad…. Apparently the claws in the foot do extend. That red looks MIGHTY fine.